Christmas is getting closer! I've pretty much all of my shopping now, and most of the crafting too. Jack opened the first window on his calander this morning. Tom's still a bit little for that yet (poor mite, I do feel mean) but he is getting extra cuddle and kisses instead. The Christmas Tree is still firmly up in the loft though. I have been hinting (out right pestering actually) for a while only to have Mark say "It's only fecking November!" but he can't say that now, can he? Hee hee! He keeps going on about the "12 days of Christmas" which is all very well, but that starts on Christmas day, right? (I'm pretty certain on that fact, message me if I'm wrong) NO WAY ARE WE WAITING TILL THEN! 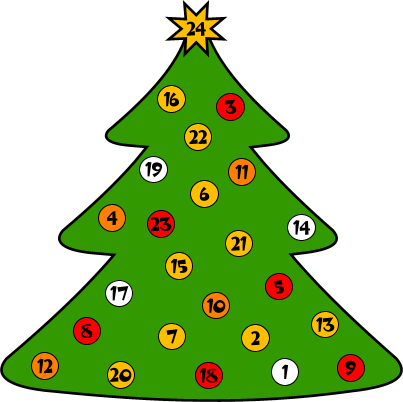 Today is the first day of advent.... today should be Christmas Tree day! Oh, and I've been playing Christmas songs to the kids off YouTube too!